L 7 1/2″(19 cm). Sexes similar. Sharp “peet-weet” or repeated “weet” notes. Description: Brown above and white below. 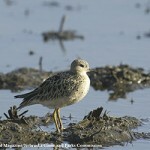 In breeding plumage underparts are distinctively marked with large, dark spots. Black eye-line; white eyebrow; short yellow bill; yellowish legs; white wing stripe shown in flight. Behavior: Identified readily by tail-bobbing gait and manner of flight, which is low over the water with stiff fluttering wingbeats. 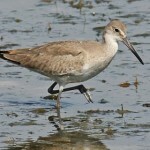 Habitat: Wetlands and similar habitats with exposed or sparsely vegetated shorelines or islands. Where in Nebraska: Characteristics of the shoreline appear to be more important than type of water body. Common spring and fall migrant and summer resident in all parts of the state. Regular breeder. 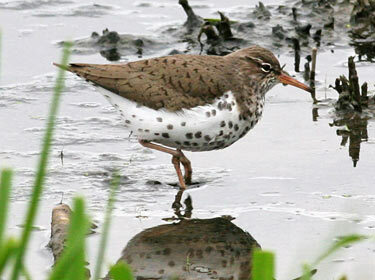 Fun Facts: Spotted Sandpiper females defend breeding territories while the male incubates and cares for the young. 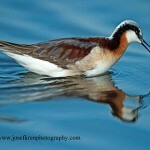 Additionally, the female may mate with many males and can hold the sperm for up to a month to delay fertilization.